The Aggie football games I always look back on are the close victories, the wins over rivals, the upsets and the gritty finishes when something big is on the line. The 50-or-more point wins over teams like Tennessee Tech are plenty fun while they are happening, but they aren’t games I remember well years later. This year’s New Mexico State game was an exception. Most Utah State fans expected a blowout – and they got it. This wasn’t the first time USU sent the other Aggies back to Las Cruces on the losing side of a lopsided game. A one-sided win over lower-level competition shouldn’t be that memorable, but Dominik Eberle, the junior kicker out of Nuremberg, Germany, made it unforgettable. The guy known by his teammates as “Das Boot” hit field goals from 44, 32, 51, 21, 51, and 51 yards, setting all-time conference marks and tying two NCAA records – most points scored by a kicker in a game (24) and becoming the sixth player ever to make three 51-yarders in a single game. I don’t think a kicker has ever been my favorite player to watch on a football team, but that is what is happening right now. It’s easy to like a guy like Eberle, and it has more to do than just being really, really good. When he missed four field goals last year in the Arizona Bowl, he accepted responsibility. He didn’t need to, but he got on Twitter and apologized. But what about less than two weeks ago after he broke a bunch of school and conference records and tied some national ones? He didn’t take the credit. He gave to his teammates and to his holder. He’s got humility. He’s got a good story, too. Eberle moved from Germany to California when he was in high school. He told me in an interview last season that soccer was his sport growing up. He said he couldn’t name a single college or professional football team when he came to the US, but after a friend saw how well he could kick a ball he encouraged him to give the American sport a try. He excelled at the high school level and later joined Utah State as a walk on. 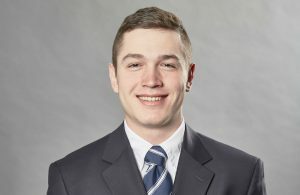 After balancing school, work and a part time job during his redshirt season, then doing it again for another year, Eberle was offered a scholarship. 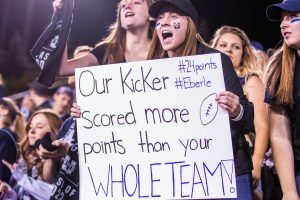 With just one more field goal against New Mexico State, Eberle could have done what no other kicker has ever accomplished at the college level, but during the game Coach Matt Wells told him he wouldn’t get that chance. Eberle was fine with it. How can you not cheer for a guy like that?